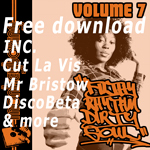 Need more soul in your b-boy sets or b-boy in your soul sets? 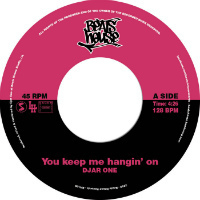 Djar One’s your man as he re-versions two sista cuts from the sixties! First up is a supreme-ly beat-match friendly take on the Holland-Dozier-Holland-penned You Keep Me Hangin’ On as sung by everyone’s favourite Motown girl group. Meanwhile, on the flip you’ll be feeling the drums as some heavyweight syncopation gets added to Felice Taylor’s northern soul classic I Can Feel Your Love. Naturally it would be wrong if this didn’t come out on 45 and come out on 45 it certainly does at the start of next month in strictly limited black vinyl (200 copies only) and even more strictly limited white vinyl (100 copies only).